mikeghouse November 17, 2018 November 17, 2018 Comments Off on Is the Mosque leadership ready to welcome the Muslim Congresswomen? Now that Ilhan Omar and Rashida Tlaib are elected to the US House of Representatives, they will be invited to speak in different forums, Churches, Synagogues, Temples, and Mosques. American Muslims will be tested in how they treat the newly elected legislators. Both the Congresswomen would be delighted to speak from the pulpits, and most of the Mosques will welcome them as well, except a few. The purpose of this article is twofold – to bring awareness to fellow Muslims to guard themselves against potential mishaps, and fellow Americans that what they may witness is not Islamic but the acts of a few who follow the rules of their private clubs under the banner of Islam. There are two Islams, the public and private Islam. Public Islam is open to all and follows on the universal teachings of Prophet Muhammad (PBUH) with least restrictions. It is not controlled by anyone and accommodates a range of practitioners from observers of rituals to non-practitioners. One can call himself or herself a Muslim with or without practicing the rituals. Private Islam, on the other hand, is run like a private club with narrowly defined rules of membership, and controlled by donors or the loud voices with restrictions on what the followers can do. The misogynistic men in every faith and social group believe that a woman’s place is home and not in public. Muslim women are rarely given the spot on the Islamic pulpit to address the congregations. 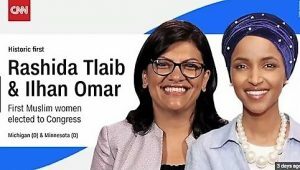 The leadership of the mosques needs to be conscious of the fact that if they had allowed a non-Muslim woman politician to address the gathering from the pulpit, these two Muslim Congresswomen must be accorded the same spot. Every group has a right to practice their faith as they deem it fit, as long as discrimination is not practiced against an individual because of her religion, race or sexual orientation. The Muslim Americans born in America are like all other Americans; open-minded and respectful of the otherness of the other. The ultra-conservatives among religious Muslims reluctantly accept a woman’s leadership amidst them. Dr. Hind Jarrah was honored by the Dallas Peace Center for her work in establishing the Texas Women’s Foundation for disadvantaged women. When she went to receive the trophy on the stage, almost every one of the male members on her table walked out of the hall. It was embarrassing, and I had to move to her table to congratulate and give her company. My late wife was recommended to be on the board of an Islamic center; she was sidelined by communicating to her that the board members will be ready in a few years to have a woman on the board. That is when we decided for her to run for the City council of Carrollton, of course, she lost by 81 votes, but perhaps, it made the men think about inclusion. In the last ten years, several Islamic Centers have chosen women to lead their centers including the Muslim Community Centers in Silver Spring, Maryland and Long Island, New York, and a few in California and I hope this trend catches on. Muslim women have always led the civic and other organizations but not religious organizations. The religious policing in the mosques is down considerably. Men used to order around women to cover their hair or tell them where they can or cannot go or how to pray. They did not even spare the second American Muslim Ambassador Sada Cumber. When he went to pray in a mosque in Austin, Texas, the Imam told him that his way of praying, that is dropping the hands on the sides instead of placing them folded on the stomach was not acceptable. Congresswomen Rashida and Ilhan have paved the way for the new generation of Muslim women to find their way in the civil society. The Islamic community needs to encourage Muslim women to lead; if not, they will miss out on a talented pool of Muslims women, who will abandon their desire to serve the Islamic communities and join the civil society to help, where they will be given full value for their service.